The use of social networking sites and instant messaging apps, despite playing a key role in building social relations, poses a risk, such as cybergossip. This research focused on the study and measurement of the cybergossip phenomenon and the psychometric properties of the Cybergossip-Q-Primary instrument. Cybergossip involvement in the development of cyberbehaviours performed in cyberbullying was analyzed. The European Cyberbullying Intervention Project Questionnaire (ECIPQ) was adapted to primary school-age children. The sample comprised 866 students (52.9% girls) with ages ranging from 10 to 13years (M=11.21, SD=0.90). Using both exploratory and confirmatory factor analyses, the fit of a one-dimensional structure for the cybergossip instrument and a two-dimensional structure for cyberbullying (cyberaggression and cybervictimization) were contrasted. A structural equations analysis revealed a significant relationship between cybergossip and cyberbullying. The results in relation to cybergossip, cyberaggression, cybervictimization, and the consequences of misinterpreting information are discussed. A pesar de que la utilización de redes sociales y de aplicaciones de mensajería instantánea juega un papel muy importante para establecer relaciones sociales, supone riesgos como el cibercotilleo. Esta investigación se ha centrado en el estudio y medición de este fenómeno y de las propiedades psicométricas del cuestionario de cibercotilleo, Cybergossip-Q-Primary. Se analiza la implicación del cibercotilleo en la formación de los cibercomportamientos presentes en el ciberacoso. Se adaptó el Cuestionario del Proyecto Europeo de Intervención en el Ciberacoso a niños en edad escolar. La muestra constaba de 866 alumnos (el 52.9% niñas) en edades comprendidas entre los 10 y 13 años (M=11.21, DT=0.90). Mediante análisis factoriales exploratorio y confirmatorio se contrastó el ajuste de una estructura unidimensional en el instrumento de cibercotilleo y bifactorial en el de ciberacoso (ciberagresión y cibervictimización). El análisis de ecuaciones estructurales mostró una relación significativa entre el cibercotilleo y el ciberacoso. Se comentan los resultados relativos al cibercotilleo, la ciberagresión y la cibervictimización, así como las consecuencias que conlleva malinterpretar la información. Social networking sites and instant messaging applications have become virtual platforms that, actively, promote the emergence, development, and maintaining of various types of relationships and behaviours via information and communication technologies (Boyd, 2008; Chang & Cheng, 2014; Davenport, Bergman, Bergman, & Fearrington, 2014; Ellison, Vitak, Gray, & Lampe, 2014; Valkenburg & Peter, 2009). Social networking use is widespread and forms an integral part of the social lives of teens, adults and, increasingly more so, young boys and girls. Findings from recent studies connected to the Net Children Go Online project (EU Kids Online), which addresses the impact that the changes regarding Internet usage conditions has on online security among young boys and girls, have reported social network use to be the activity that 9 to 12 year olds spend the most time and attention on (27% of 9 to 10 year olds and 60% of 11 to 12 year olds have a social network profile), despite the fact that the presence of minors on such sites is legally restricted to 16 year-old users and over approximately (Mascheroni & Cuman, 2014), and is prohibited in some countries. Furthermore, as indicated by Livingstone, Haddon, Vicent, Mascheroni, and Ólafsson (2014), 41% of those aged between 9 and 16 use instant messaging services. Social networking sites and instant messaging apps enable users to socially interact with one another as well as publish and share personal and social information among followers and friends, as is the case of Facebook, Instagram, Tuenti, Twitter, and WhatsApp (Chang & Chen, 2014; Davenport et al., 2014; Lee, 2014; Reinecke & Trepte, 2014; Spies & Margolin, 2014). This group of online platforms is characterized as having a public, semi-public, or private profile (Oh, Ozkaya, & LaRose, 2014; Reinecke & Trepte, 2014). Instant messaging apps such as WhatsApp allow messages, photos, videos, and recordings to be shared and spread imminently and in real time. Despite lacking a social profile, a Google or Apple account is required to be able to access them. The interactions that take place in cyberspace are commonly referred to as cyberbehaviours (Ortega, Del Rey, & Sánchez, 2012); they play a key role in the socialization process by enabling individuals to broaden their social networks. The content of the messages that result from these interactions can take on different nuances with varying characteristics. In moral terms, they can be classed as positive, negative or neutral, as is the case of gossip, namely comments made about other people. This phenomenon has been widely recognized in real world situations, where approximately 70% of conversation time is seen to involve this type of talk (Emler, 1994). However, scientific studies assessing the nature of gossip as an emerging and interactive behaviour that occurs in the virtual world of social networking sites and instant messaging apps are limited. This type of cyberbehaviour is known as cybergossip (Laghi et al., 2013; Oluwole, 2009; Subramanian, 2013). Before analysing the phenomenon of cybergossip, it is necessary to revisit the concept of gossip, recognized as a form of seemingly innocent conversations that always involve evaluative nuances expressed by two or more people about somebody who is not present (Foster, 2004; Levin & Arluke,1987; McDonald, Putallaz, Grimes, Kupersmidt, & Coie, 2007). These are situation-based conversations, where the message being conveyed and its interpretation depend on the message's context and its features (Foster, 2004; Guerin & Miyazaki, 2003; Wert & Salovey, 2004). This behaviour is characterized as being subordinate to the interests of the person spreading the gossip (Levin & Arluke, 1987). There is no doubt that gossip impacts on the inner workings of the social group in which it occurs. This impact may be inclusive; positive gossip may help someone new become accepted in a group or could make more popular which was already part of it. Meanwhile, gossip of a negative or devaluative nature may result in a person being kicked out of the group by its other members, thus losing credibility and social status (Hartung & Renner, 2013; Levin & Arluke, 1987; Turner, Mazur, Wendel, & Winslow, 2003). The development of behaviours linked to gossip depends on the group's own normative beliefs; for example, those associated with the acceptance or rejection of gossip and the support the group attributes to this conduct (Eder & Enke, 1991; Foster, 2004; Low, Frey, & Brockman, 2010), as well as the person's level of maturity when it comes to interacting and communicating with their peers (Björkqvist, Lagerspetz, & Kaukiainen, 1992) and the topic being discussed (Nevo, Nevo, & Derech-Zehavi, 1993). Furthermore, it should be noted that the status and popularity of the gossiper play a very important role in the use, spread, and credibility of what is being said (Levin & Arluke, 1987; McDonald et al., 2007; Watson, 2012). For gossip to flourish, one must belong to a social group where trust among its members prevails, sharing the same values and standards, which in turn facilitates the delivery, interpretation, evaluation, and spread of gossip. Moreover, this talk, in a cybergossip setting, needs to be short and to the point acceptable and interesting (Cole & Scrivener, 2013; Dunbar, 2004; Levin & Arluke, 1987; McAndrew, 2014). Finally, it is imperative that the other person who is being spoken about behind their back is familiar to the group and onlookers (Guerin & Miyazaki, 2003; McDonald et al., 2007; Rosnow & Fine, 1976). Gossip about other people implies a series of intentions that enable us to interpret the message. Thus, gossip may perform different functions according to the specific intentions. These include: a) to inform, which refers to spreading information to other people; b) to entertain and derive enjoyment from this activity; c) to build friendships and maintain them via a shared understanding of social standards and the creation and nurturing of bonds involving closeness and trust; and d) influence, whereby gossip is used as a means of interfering in the way the listeners react towards and view the other person being gossiped about (Cox, 1970; Foster, 2004). The performance and fulfilment of these functions require an unconscious yet observable use of the gossip phenomenon's basic structure: 1) the first moment when the person (target) of the gossip episode is identified; 2) evaluation of and immersion into the gossip deemed negative, positive, or neutral and which influences how the listeners might interpret the gossip being communicated; and 3) responses, which covers the level of support from the listeners, the expansion of evaluation by the onlookers, the request for clarification, and the explanation or over-reaction from the aforementioned group (Eder & Enke, 1991). The gossip phenomenon has primarily been measured through observation, identified as a socially enhancing behaviour that promotes the exchange and adoption of socially and culturally driven learning experiences (Baumeister, Zhang, & Vohs, 2004; Hartung & Renner, 2013; Wert & Salovey, 2004). However, research which has used a self-report measure to assess gossip has identified it as an inherent and defining dynamic of indirect relational aggression: The Direct and Indirect Aggression Scale (DIAS) (Björkqvist, Lagerspetz, & Österman, 1992) and The Indirect/Social/Relational Aggression scale (ISRA) (Coyne, Archer, & Eslea, 2006). In fact, it has been treated as a must-prevent behaviour in anti-bullying programmes (Committee for Children, 2001; Low et al., 2010). Wert and Salovey (2004) suggested that this construct should be measured as an independent phenomenon, moving away from the reductionist view of gossip which identifies it as a form of relational aggression. The Gossip Functions Questionnaire (Foster, 2004) adopted this all-encompassing vision of the concept, although the validation results were not conclusive. This information makes us to plan an analysis which led us to design a questionnaire about cybergossip, as an independent phenomenom of relational aggression, adapted to students of Primary Education. Therefore, a simpler version will be proposed considering the four basic subscales mentioned by Foster (2004). There are currently no instruments that measure cybergossip as a form of social behaviour conducted via social networking sites and instant messaging apps, whose structure and features make it possible to produce, spread, and maintain gossip about other people (McAndrew, 2014; Tufekci, 2008). Cybergossip is a new form of gossip, but it could show some differences owing to the very nature of the virtual context, much like in the case of the bullying and cyberbullying phenomenon, which are understood as forms of intimidation, harassment, and maltreatment that implies different features depending on the context (offline/online). Thus, cybergossip has the potential to become a cyberbehaviour enhanced by ease of access to the Internet, digital competence, accessibility to a large number of recipients, and being able to engage in this conduct anytime and anywhere (Kowalski & Limber, 2007; Navarro & Yubero, 2012; Valkenburg & Peter, 2011). Similar to traditional gossip, this cyberbehaviour may also come with positive effects; however, this does not exempt it from displaying negative behaviours that may compromise the participants actively engaged in this activity. This fact could be argued by taking the theories behind cyberbullying, as a precedent, whereby simply showing a greater presence in cyberspace as well as excessive and frequent use is considered a risk factor that could trigger a series of negative effects (Akbulut, Sahin, & Eristi, 2010; Smith et al., 2008; Ybarra & Mitchell, 2004). In that sense, young people may resort to cybergossip in order to increase their online presence and in turn to boost popularity. According to Ortega et al., 2012, their online presence and use may render them more vulnerable, potentially opening them up to cyberaggressive behaviours since the more time they are on Internet, the more risk they can take. This negative effect could be also compounded by the difficulty faced by the gossiper in getting across what he/she intends to communicate (it can be negative, positive, or neutral) (Foster, 2004; Levin & Arluke, 1987; McDonald et al., 2007) and for the receiver in knowing how to interpret the gossip, particularly given the characteristics of the virtual world and the lack of prosodic, paralinguistic, and extralinguistic elements of spoken interaction. These elements complement communication and help to understand the information being shared and the emotions that arise from these interactions (Carrera & Pelayo, 2002). This shortcoming could lead to misunderstandings and, consequently, the development of risk cyberbehaviours such as cyberbullying, defined as a type of indirect bullying (Del Rey, Elipe, & Ortega-Ruiz, 2012). This evidence directs us towards studying cybergossip as a cyberbehaviour, separate from the indirect relational aggression, but which may nevertheless trigger behaviours inherent in cyberbullying, which include cyber-aggression and cyber-victimization and is understood as an intentional aggression, by a group of people or a person, using technological ways to communicate, many times, to a victim who cannot defend by his/herself (Smith, 2006). By this way, cybervictimization refers to the repeated and intentional aggression suffered by the students while using their mobile phones or Internet. These aggressions consist of written or visual aggressions, exclusion or impersonation, among others (Nocentini et al., 2010). On the other hand, cyber-aggression is defined by Mason (2008) as “an individual or a group wilfully using information and communication involving electronic technologies to facilitate deliberate and repeated harassment or threat to another individual or group by sending or posting cruel text and/or graphics using technological means” (p. 323). The aims of this study were to a) adapt and design a questionnaire whose reliability and validity criteria allow us to assess the cybergossip phenomenon in primary school students; b) adapt the European Cyberbullying Intervention Project Questionnaire (ECIPQ) to primary school students; and c) analyse the influence cybergossip can have when cyberaggression and cybervictimization are involved. This study followed an instrumental, cross-sectional, ex post facto design (Montero & León, 2007). Eight hundred and sixty-six (866) students (46.9% boys, 52.9% girls) from southern Spain, distributed across the last three years of primary education (PE)–4th year (n=249), 5th year (n=250), and 6th year (n=366)–participated in the study. Participants’ ages ranged from 10 to 13 years; the mean age was 11.21 (SD=0.90). Incidental sampling was used, that is, a non-probability sampling in which the population selected has been accessible to the researchers. Sociometric questions were drawn up. They covered age, gender, school year, and participation in social networking sites and WhatsApp (e.g., “Do you use WhatsApp to converse with friends and family?”). Items were measured on a nominal scale (1=yes, 2=no). Cybergossip-Q-Primary (ω=.89). This questionnaire was designed in order to analyse its psychometric properties and to evaluate primary students’ participation in cybergossip-related behaviours. This 9-item instrument is based on the Gossip Functions Questionnaire (Foster, 2004) which measures the four main functions of gossip: information (e.g., “I use social networking sites or WhatsApp to share with my friends the stories I hear about other people”); influence (e.g., “I have used social networking sites or WhatsApp to talk about a classmate or friend so that the group changes their opinion about him or her); friendship (e.g., “I talk about other people on social networking sites or on WhatsApp because it makes me feel closer to my circle of friends”); and entertainment (e.g., “I talk with my friends on social networking sites or on WhatsApp about what's going on with other classmates for fun”). All 9 items were scored on a Likert-type frequency scale (values from 0=never to 4=always). Adaptation of the Spanish version of the European Cyberbullying Intervention Project Questionnaire (ECIPQ) (Del Rey et al., 2015) for the primary school setting (ω=.95). The instrument's design adheres to the original two-scale questionnaire, covering both cyberaggression and cybervictimization, which describe the cyberbullying phenomena. Each construct comprises 8 items scored on a Likert-type frequency scale (0=No; 1=Yes, once or twice; 2=Yes, once or twice a month; 3=Yes, about once a week; 4=Yes, more than once a week) concerning cyber-aggressive behaviours (ω=.91) (e.g., “I have insulted someone using social networking sites or WhatsApp”) and cybervictimization (ω=.90) (e.g., “Someone has insulted me using social networking sites or WhatsApp”) over the last two months. Specifically, six items referring to online piracy/deception, that were part of the ECIPQ, were merged into two in order to facilitate the comprehension of these items to primary school students: “Somebody has pretended to be me on social networking sites or WhatsApp” and “I have pretended to be someone else on social networking sites or WhatsApp to hurt another person”. Recommendations from a group of experts were followed when adapting this questionnaire to primary school students. A confirmatory factor analysis (CFA) was performed to confirm whether the psychometric properties, which will be seen later, remained invariant. In order to identify the type of activities and interactions carried out by primary school boys and girls via the Internet, an initial focus group was carried out comprising third- to sixth-year pupils from two schools located in Córdoba (Spain). Once the questionnaire had been developed, a pilot study was conducted at a school to ensure the suitability of each item. Before administering the definitive questionnaire, nine schools were contacted; a letter was sent to each school's director as well as detailed information about the study, taking into due consideration the strict rules governing the participating students’ anonymity and right to privacy, and with the permission of their parents or legal guardians. Prior to completing the questionnaires in person, the researchers in charge of gathering the data explained to the pupils the concept of social networking sites and instant messaging apps and how they should go about responding. Above all, they were asked to be as honest as possible when answering each question or statement. Response times ranged from 15 to 20minutes. A month later, the recommended time to perform test-retest reliability analysis (Cea D’Ancona, 1996), the questionnaires were administered again, this time to a subsample of 143 students recruited from two schools in Córdoba city and province respectively. A control code was assigned which enabled researchers to identify those students who had completed the questionnaires during this follow-up stage. Following the recommendations made by Neukrug and Fawcett (2014) to validate the questionnaires, the sample was split equally into two parts, with a proportional number of boys and girls. One half of the sample underwent exploratory factor analysis using a maximum likelihood estimation method (ULS), principal-component analysis, and parallel analysis, employing the Factor 9.2 program which permits the use of polychoric correlation matrices, recommended when working with non-normal distributions and ordinal variables (Freiberg, Strover, de la Iglesia, & Fernández, 2013; Lorenzo-Seva & Ferrando, 2006). The other half of the sample was subjected to confirmatory factor analysis using the robust maximum likelihood (RML) estimation method via LISREL 9.1 (Jöreskog & Sörbom, 2012). McDonald's omega (ω) was computed using Factor 9.2, recommended for evaluating the reliability of ordinal variables (Woodhouse & Jackson, 1977). Variables that failed to meet the following criteria were excluded: items in the exploratory factor analysis with a communality of less than .20 and a factor loading below .40 (Costello & Osborne, 2005), and those items in the confirmatory analysis with factor loadings less than .40 (Flora & Curran, 2004). The statistical package SPSS (version 18) was used to perform univariate descriptive analyses of frequency, as well as test-retest using Spearman's correlation coefficient, recommended for ordinal variables, which involved repeating the questionnaires used in both schools under similar conditions. Finally, structural equation modelling was used to analyse cybergossip's influence on and relationship with cyberbullying. The fit of the model and CFA were examined by taking into account the following indexes: the Root Mean Square Error of Approximation (RMSEA); the Standardized Root Mean Square Residual (SRMR) whose recommended values are<.08; the Goodness-of-Fit Index (GFI); the Non-Normed Fit Index (NNFI); the Relative Fit Index (RFI); the Comparative Fit Index (CFI), with recommended values set at>.95; and finally, the Expected Cross-Validation Index (ECVI), whose values close to zero represented a greater likelihood for generalization of the model. The analyses were performed using the statistical software package LISREL 9.1 (Jöreskog & Sörbom, 2012), enabling the use of polychoric correlations, which are best suited when dealing with variables presenting the described characteristics (Flora & Curran, 2004). Univariate descriptive analyses of frequency were calculated, taking those students who had selected the “Yes” option as the point of reference. The results revealed that the 31.3% reported using social networking sites to communicate with family and friends and 91.7% used WhatsApp for this purpose. In response to the first objective concerning the validation of the cybergossip questionnaire, EFA and CFA were conducted. The EFA showed that the cybergossip instrument was best described by a unifactorial solution. The Kaiser-Meyer-Olkin (KMO) test, with a value of .86, and Bartlett's Test of Sphericity (1119.7, p ?? .01) revealed single-factor sampling adequacy accounting for 58%of the total variance. Most of the questionnaire items yielded loadings above .40 and a communality more than .20 (Costello & Osborne, 2005) (see Table 1). The polychoric correlations matrix between items yielded values ranging from .35 to .69. The indexes obtained in the CFA revealed a good fit of the model: S-Bχ2=82.623; NNFI=.97; CFI=.98; IFI=.98; RMSEA=.056; 90% of the confidence interval of the RMSEA=(.039 - .074) (Hu & Bentler, 1999; Ruiz, Pardo, & San Martín, 2010). An adequate value of the reliability index was found (ω=.89) (see Figure 1). 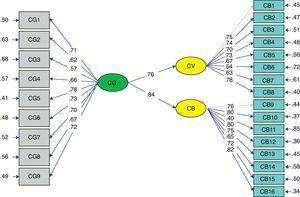 Standardized Factor Loadings of Confirmatory Factor Analysis for Cybergossip-Q-Primary. The test-retest analysis was carried out on a sample of 143 students. This analysis yielded a significant Spearman's correlation coefficient (rho=0.49, p<0.01). As for the second objective, the cyberbullying questionnaire's two-dimensional structure was subsequently validated once some of the items had been adapted to the primary school context. The CFA showed a good fit according to the indexes obtained: S-Bχ2=2.36; NNFI=.97; CFI=.98; IFI=.98; RMSEA=.056; 90% of the confidence interval of the RSEA=.047-.065. In addition, the instrument showed adequate reliability indexes (McDonald's omega=.95) comprised of two factors that refer to cybervictimization (ω=.90) and cyberaggression (ω=.91). To address the third objective, specifically the relationship between cybergossip and cyberbullying from the perspective of its two factors (cyberaggression and cybervictimization), a structural equation model was developed (see Figure 2). The index values of the fit of the model were: S-Bχ2=614.97, p<.001; RMSEA=0.018; ECVI=0.83; NNFI=0.98; CFI=0.97; RFI=0.99; SRMR=0.071; GFI=0.97, yielding a good fit, where the explained variance of the cybervictimization variable was 58% and 71% for the cyberaggression variable. 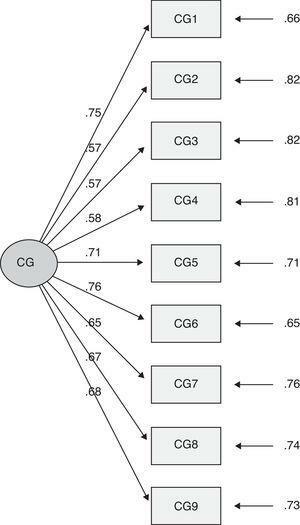 The results revealed a positive correlation between cybergossip and cybervictimization (β=.76, p<.00) and between cybergossip and cyberaggression (β=.84, p<.00). The covariances of latent variables were .74 with cyberaggression and .66 with cybervictimization. Graphical Solution of the Structural Equations Model. This research has focused on cybergossip and cyberbullying during primary school years and the possible link between both constructs. The aim was to identify Internet habits and uses among primary school students, analyze the psychometric properties of the Cybergossip-Q-Primary measure and of the adaptation of the European Cyberbullying Intervention Project Questionnaire aimed at boys and girls, and to identify the influence that cybergossip has on cyberbullying. The results revealed a high use of the instant messaging app WhatsApp. Social networking sites are also widely popular among this age group, despite the fact that under 16s are prohibited from using them. These findings are consistent with the results of other European studies which report a widespread use of social networking sites and instant messaging services among boys and girls aged between 9 and 11 years (Livingstone et al., 2014; Mascheroni & Cuman, 2014). Schoolchildren's ever-increasing usage of social networking sites and instant messaging apps and their greater presence in these environments has much to do with these being the ideal platforms for building social relationships among peers, strengthening friendships, and meeting the need to constantly be connected and kept updated about all events and developments happening around them. This ongoing interaction also encourages the development of social norms among these youngsters, leads to acceptance by their peers, and helps shape their personality (Boyd, 2008; Chang & Chen, 2014; Davenport et al., 2014; Ellison, Vitak, Gray, & Lampe, 2014; Valkenburg & Peter, 2009). Cybergossip, much like traditional gossip, involves a developed style of communication, this time by means of the Internet and by using telematic media. To date, there have been no instruments to measure the prevalence of web-based gossip, understood as a behaviour that can either promote or hinder peer relations. Hence, there is a real need for designing and validating a measure that informs us about how this cyberbehaviour develops among schoolchildren. The results concerning the validation of the Cybergossip-Q-Primary measure have led to the conclusion that the developed instrument has good psychometric characteristics, given that the fit indexes and validation standards have shown to be adequate in line with the one-dimensional structure (Byrne, 2013; Hu & Bentler, 1999; Neukrug & Fawcett, 2014). Equally optimal results were obtained in the adaptation of the cyberbullying questionnaire aimed at primary school boys and girls. Consistent with the outcomes of the original version for adolescents, a two-dimensional structure (cybervictimization and cyberaggression) was observed. This study, which has considered cybergossip as an independent behaviour in line with Wert and Salovey's (2004) contributions, has acknowledged the influential role played by this phenomenon on risk behaviours traditionally associated with making comments about other people–for example, aggression–and which may grow in complexity and reach given the features characteristic of virtual environments (McAndrew, 2014; Tufekci, 2008; Valcke, De Wever, Van Keer, & Schellens, 2011). What is more, the results clearly point to a direct relationship between the conscious making of comments about other peers, via social networking sites and WhatsApp, and involvement in cyberbullying behaviours, mainly cyberaggression, by schoolchildren aged 10 to 13 years. Thus, this study shows cybergossip to be a complex, communicative behaviour that has emerged as a new, independent construct, and which goes beyond cyberbullying, although it still exerts a degree of influence on the latter. However, the role of victimization remained diluted in previous studies (Björkqvist et al., 1992; Coyne et al., 2006; Hartung & Renner, 2013; Levin & Arluke, 1987; Low et al., 2010; Turner et al., 2003). Bearing in mind that this study has measured cybergossip, where the intention is not to do harm, this complex and deeply rooted relationship between cybergossip and cyberbullying (cyberaggression and cybervictimization) could be explained by the frequent difficulties involved in interpreting these messages sent online (Carrera & Pelayo, 2002; Foster, 2004; Levin & Arluke, 1987; McDonald et al., 2007). Comments made about other people could spark an attitude of rejection from those receiving this information, causing them to react aggressively towards the gossiper or third parties, with them now becoming the victims. This behaviour may also be driven by the impulsiveness that occurs in interactive settings, that is, the Internet enables individuals to respond immediately anywhere and at any time. A further explanation for this relationship resides in the fact that the bullies (cyberbullies) feel more driven to not only be proactive in the face of these problems, but to also engage in proactive behaviour in gossip episodes using digital devices. To be able to answer the questions that arise upon interpreting the results obtained, it is necessary to continue this area of research during both primary and secondary school years, where the use of technology as a way of maintaining peer relations is becoming more and more visible, and where cybergossip may well increase given the need to be constantly kept in the loop. The findings of this study have led us to a new construct independent from cyberbullying, in that cybergossip has shown to be a complex, communicative online behaviour whose practice may encourage behaviours associated with cyberaggression and cybervictimization, while also promoting positive behaviours. This relationship allows us to broaden the scope of study into cyberbullying as well as identify the cyberbehaviours developed by primary school-age students, a period which has received little research attention. These findings, however, should be treated with caution, as cybergossip is not always conducive to behaviours typical of cyberaggression and cybervictimization. That said, it may be considered a cause of cyberbullying if misunderstandings arise, the information or rumour is taken out of context, or if there is intent to inflict harm with a comment or rumour which was not intended this way. One of the foremost aspects of human interaction is the importance of gestural or non-verbal communication, something which is missing in virtual relationships (Montepare, 2014). For this reason, the present research seeks to highlight the potentially important role played by this lack of non-verbal communication and the emergence of misunderstandings, conflict, and attributions of intent not found in the sender or receiver. When talking about third parties, specifically commenting in instant messaging groups or revealing secrets during private conversations, the latest technologies make it possible to save and store this information. This content can be used to spread malicious rumours, taken out of a wider context and used to twist the truth. As such, it is important to take into account the possible negative consequences of cybergossip to ultimately help improve interpersonal relations among primary-age children via digital devices. This has considerable educational repercussions, given that the school is responsible for teaching and fostering communicative and digital competencies among its students. Young people would benefit from specific training aimed at helping them build their digital communication skills to avoid the risk of becoming involved in cyberbullying or similar scenarios. In terms of the study limitations, we can highlight two: sample size and design. Future research should include more students, which would permit a greater generalization of the results obtained. Meanwhile, the study's cross-sectional design limits interpretation from the perspective of variable directionality. A dynamic approach to this phenomenon using longitudinal data would allow us to trace its development, thus significantly enriching understanding of the relationships between cybergossip and cyberbullying. This paper was produced as part of the project EDU2013-44627-P, funded by the National Research Plan I +D and the project PSI2016-74871-R funded by the Spanish National I+D+i Plan. Björkqvist, K., Lagerspetz, K. M. J., & Österman, K. (1992b). The Direct & Indirect Aggression Scales (DIAS). Åbo Akademi University. Department of Social Sciences, Vasa, Finland. Cea D’Ancona, M. A. (1996). Metodología cuantitativa: Estrategias y técnicas de investigación social. Madrid: Síntesis. Del Rey, R., Casas, J. A., Ortega-Ruiz, R., Schultze-Krumbholz, A., Scheithauer, H., Smith, P., … Plichta, P. (2015). Structural validation and cross-cultural robustness of the European Cyberbullying Intervention Project Questionnaire. Computers in Human Behavior, 50, 141-147. Jöreskog, K.G., & Sörbom, D. (2012). LISREL 9.10 for Windows [Computer software]. Scientific Software International, Inc. Skokie, IL. Mascheroni, G., & Cuman, A. (2014). Net Children Go Mobile: Final report (Deliverables D6.4 & D5.2). Milano: Educatt. Mason, K. L. (2008). Cyberbullying: A preliminary assessment for school personnel. Psychology in the Schools, 45, 323-348. http://dx.doi.org/10.1002/pits.20301. Ortega, R., Del Rey, R., & Sánchez, V. (2012). Nuevas dimensiones de la Convivencia Escolar y Juvenil. Ciberconducta y Relaciones en la Red: Ciberconvivencia. Secretaría General Técnica. Madrid. Retrieved from: http://www.uco.es/laecovi/img/recursos/p5xqp1s849A8yPq.pdf. Smith P. K. (2006). Ciberacoso: naturaleza y extensión de un nuevo tipo de acoso dentro y fuera de la escuela. Trabajo presentado al Congreso Educación de Palma de Mallorca.